An opportunity to slow the pace at the end of the week so that you can really relax body and mind and feel restored and grounded once more. The yoga which is suitable for all including complete beginners is floor-based and meditatively flowing, connecting and following the breath and moving the spine through it's full range of movement so that tension is released. This is followed by yoga nidra (yogic sleep); a guided technique which enables you to reach the deepest state of relaxation whilst being fully aware and is great for counteracting the effects of stress on body and mind and promoting good sleep (in fact it's used with US veterans who suffer from PTSD). Places are limited to 14. Want to do something different, fun and uplifting? Like dancing? Dru Yoga Dance is an exhilarating and joyful fusion of classic yoga poses and dance moves choreographed to music and designed to be practiced on your mat like a yoga sequence but with the joy of dance thrown in! You don't need any experience of dance or yoga. You will learn a whole dance in a day with instructions and a playlist so you can do this at home. The dance you will learn is Kanakadhara: Lotus in Full Bloom, a dance about attracting abundance into our lives, about giving and receiving. There'll be plenty of opportunity to ask questions, talk about meaning and interpretation or repeat parts. Bring a packed lunch, tea and cake/snacks provided. The next workshop in the Chakra Yoga series will be Saturday 9th September 2.30-5.30 once again at Clifton Village Hall. 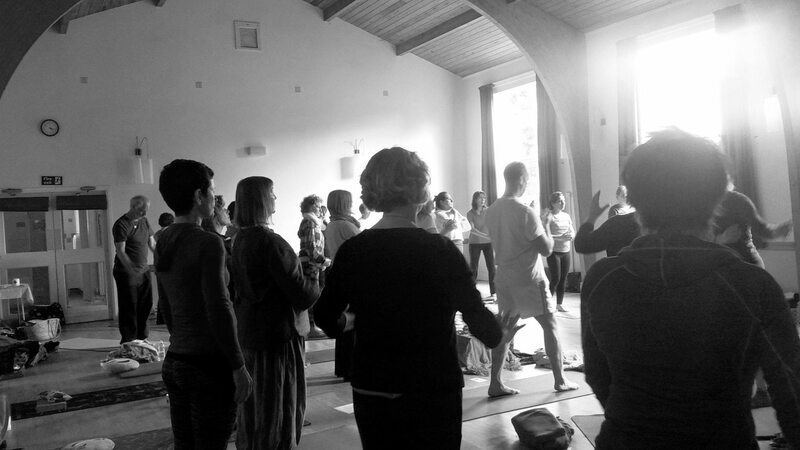 Each workshop stands alone so it is not necessary to have attended previous ones, workshops include yoga asanas, pranayama, meditation and yoga nidra as well as a handout to take away and use in your own practise!